Do you ever wish you could turn back the hands of time and decide “not” to get a tattoo that you once thought was cool when you were young? People make regrettable decisions in their youth, such as inking themselves with names of exes they are no longer with, or putting “cute” tattoos on their skin that are now faded or out of style, or symbols of organizations and other things they are no longer affiliated with or like. Sometimes, tattoos can prevent you from getting jobs or career advances. Some tattoos can be embarrassing to explain when you become a parent or grandparent, and if you have any desire to get into certain branches of the military, you may not be accepted if you have a tattoo on your face, hands or neck. And like it or not, sometimes people judge others by the tattoos they wear. So, those once cool tattoos may no longer serve you well as you get older. Rather than succumb to the regrets, there is a brand new technology called PicoSure™ that can easily remove those tattoos you no longer want on your skin. 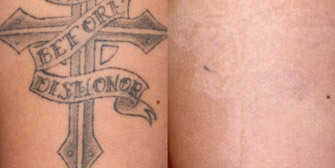 PicoSure™ works so well, you will barely be able to discern there was ever a tattoo on your skin. The highly advanced laser delivers lightning-quick energy pulses to remove the ink easily and painlessly, giving you smooth skin that flawlessly matches your pre-tattooed state. Although multiple treatments may be needed to deliver the best results, PicoSure™ requires fewer sessions than other previous methods of tattoo removal. And with less pain and recovery time! The Med Spa at Southwest Plastic Surgery of El Paso, TX, is the area’s first to bring you this exciting new technology. If you live in Texas, New Mexico, Mexico, or anywhere in the Southwest, you can visit our plastic surgery center to get tattoos removed easily and conveniently. 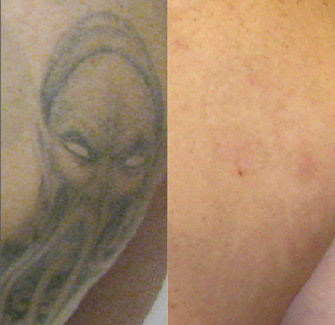 Q-Switched lasers have been used to remove tattoos for years. 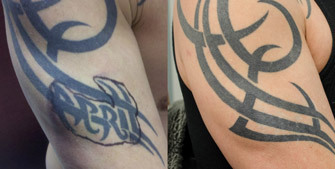 Through the use of thermal energy, these Q-switched lasers heat up the ink and break them apart, which does take a lot of sessions to accomplish, depending on where the tattoo is on a person’s body and how large or complex the graphics. With PicoSure™, the technology has evolved and made it possible for the lasers to deliver ultra-pulses at speeds of one trillion seconds, which puts more pressure on the ink particles. The tattoo ink literally shatters into dust! Your body is able to absorb and eliminate these ink particles more quickly than with other tattoo removal methods because the dust bits are so minuscule and barely visible to the naked eye. The tattoo removal specialists at The Med Spa at Southwest Plastic Surgery use a precision laser tool to deliver ultra-pulses across the area of the tattoo. Because every tattoo is different – containing its own blend of colors and layers – the treatments vary depending on every individual’s needs and the complexity of the tattoo. We are PicoSure™ certified to do tattoo removals in Southwest Texas and Southwest Plastic Surgery is one of the first to have this revolutionary tattoo removal device available to the public. 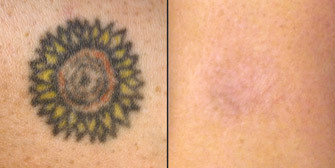 What Sets PicoSure™ Apart From Other Tattoo Removal Systems? More than 20% of all tattoo wearers live with regret of getting a tattoo. That’s right… one in five people dislike their tattoo sometime after getting it, whether it is years later or soon thereafter. Ever since tattoo removal became available, there has been a gradual increase of 43% of tattoo wearers getting them removed, largely because of employment opportunities or family reasons. But why would you choose PicoSure™ tattoo removal over other laser tattoo removal methods that are currently offered at some dermatologist offices or plastic surgery centers? One of the main reasons PicoSure™ is superior as a tattoo removal option is because patients need less treatments than the Q-Switched lasers, as well as more success. PicoSure™ recipients revealed better skin after the tattoo was removed, meaning the tattoo disappeared or was barely evident. Recovery time is another reason PicoSure™ is best for laser tattoo removal in El Paso, TX. You don’t have to wait to return to work or go about your day-to-day activities, and the pulsating laser does not hurt when applied. Surely, if you endured the pain of getting a tattoo, then PicoSure™ is like a walk in the park in comparison. Certainly tattoo removals have come a long way! Back in the day, the tattoo removal methods were archaic and potentially harmful, whereas now PicoSure™ makes it pleasant to get your tattoo(s) removed. There are no permanent side effects reported. 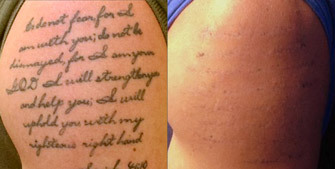 You will never resort to those scary tattoo removal methods again, such as surgery, dermabrasion or acid treatments. Steer clear of these hazardous tattoo removal processes and come talk to Southwest Plastic Surgery about PicoSure™ tattoo removal instead! What is the Cost of Tattoo Removal in El Paso? Although the treatment costs vary across the country, depending on where you live, the physician’s experience, and the size or extent of the tattoo, most people can expect to pay $500 – $2,500 for PicoSure™ over the course of several sessions. If you have a tattoo that you do not like or that does not meet your expectations, then talk to Southwest Plastic Surgery today about returning your skin back to its previously unmarred condition! Schedule a Consultation for Tattoo Removal in El Paso, Texas Today!